It’s been many months since I last updated anything on the blog…and I was already a few months behind with that post too. So with some big races still to write-up I need to catch up on all that has gone on since my last post. 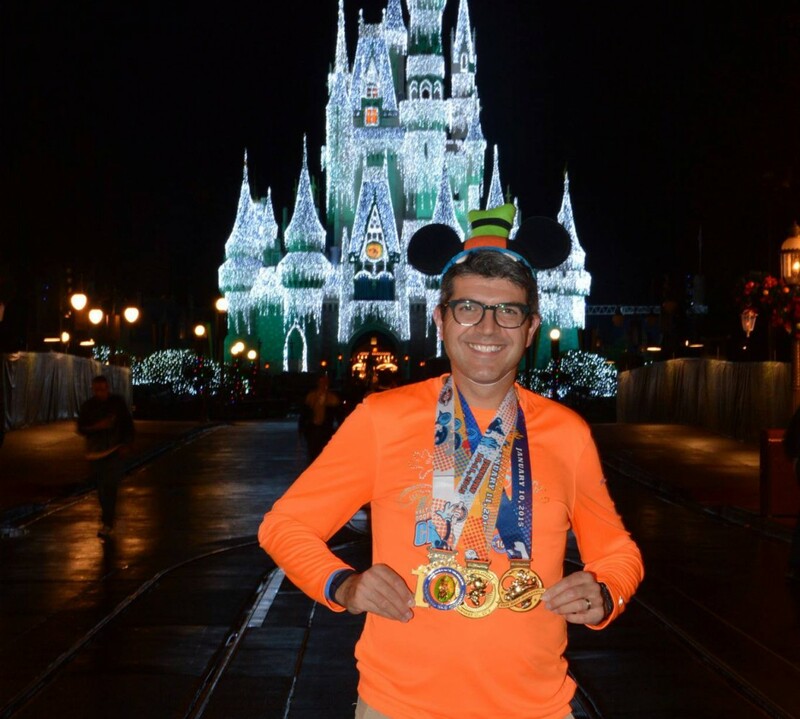 Following on from the Walt Disney World marathon weekend I had a pretty quiet Winter/Spring. In the last few years I have always taken part in a late winter/early spring half marathon and then worked up to a spring marathon. This year, however, I skipped the half marathon and used the time to prepare for the Delaware Marathon which took place on April 28th. Training through the winter is not one of my favorite things to do but does demonstrate commitment to your goals. With the snowy, cold and icy winter we had I had to maximize outdoor runs while minimizing risk of slips/falls/frostbite(!!! ), so there were a lot of indoor treadmill sessions. At one point during this training cycle I managed to break the treadmill!!! It was winter and my wife and I were using the treadmill everyday so packing on a large number of miles each day and ultimately one day the drive belt just gave up and it stopped (apparently you have to maintain and lubricate the track…oops). Luckily we were able to get an engineer out and have it fixed and I was able to mix up some outdoor workouts with my gym membership which I keep as back up. Lesson learned. I keep a maintenance kit and now have the engineer’s business card attached to my refrigerator for regular maintenance. With ‘disaster’ averted (my wife blamed me for that one) we were back on track. I was feeling good going into the Delaware Marathon. The race began and finished on the Wilmington waterfront and was a two loop race. This race was run by Corrigan Sports who also run the Baltimore Marathon that my wife and I ran back in 2014. That was a well-organized race although much bigger than Delaware. Here they still put on multiple races; a full marathon, half marathon and marathon relay. The expo was held at the DoubleTree Hotel in Wilmington, Delaware. I travelled down on the Saturday before the race for packet pickup. Although I work closer to Delaware I was unable to go after work before the weekend. The drive to Delaware was just over an hour and this was partially the reason I picked the race as I didn’t need to be away from home or get a room overnight. The expo however was actually much smaller than I anticipated. I paid for an hour on the meter and I was in and out within 20 minutes. Packet pickup was quick, efficient and easy. The race shirt was Under Armor (as was the Baltimore Marathon…good to have a race team based around Baltimore). Small expo for this race. It took longer to find street parking than the time I spent in the expo. The race is 2 loops of the same 13.1 course! Making sure I had my usual pre-race cookie I settled in for an early night. You will note that my ‘flat Ian’ is well dressed. I made an effort, after all, Delaware is the ‘First State’. Race day arrived and I got up early….really early. I wanted to make sure I was able to park close to the race location before the roads began to close. I needn’t have worried. It was an easy drive and the parking lot was just over the street from the race village. I got there early (I mean really early) and hung with the growing crowd until time came to get into the corrals. I was aiming for a race between 3:50 and 4:00 which may have been a bit ambitious (seeing as I had a few extra winter pounds on my frame). It was a beautiful morning but a little chilly at the start of the race. I felt toasty(ish) in my large plastic bag that is now a staple of my race gear. Once installed in my corral I waited for the signal to go. Once we were out and on the route I felt pretty good. I was managing my first few miles around the 8:15-8:30 pace and feeling pretty comfortable…and then there was the hill after Brandywine Park. It was quite unrelenting and lasted almost two miles straight up. I slowed down a little but was able to continue running. My splits were fairly consistent for the first half of the race. I was pretty pleased I had managed the initial climb up the hill in Brandywine Park without stopping…at least the first time. Then all of a sudden at mile 12 to 13 someone had put another hill on the course!!!! My first half splits. Pretty consistent. I’ll be honest. I knew this course was considered hilly but I still was not prepared for where exactly in the race these hills would be. The run up from mile 12 to 13 was tough. As this was a loop I would be running again I knew that this hill would again be appearing but between mile 25 to 26. I wasn’t looking forward to that and I think I let that thought get in my head. I was pretty tired when I hit the halfway point. My first half split was 1:53:29 with an average pace of 8:40/mile. This was what I had been hoping for in training. I was hoping I could sustain this for the second half. As this was where the half marathoners and marathoners split, the runners thinned out pretty quickly. We were directed to take a quick out and back along the waterfront as part of the turnaround for the marathon. It wasn’t clearly signed and a few of us were not quite sure where the turnaround was. I saw one guy continue running, and was unsure and turned around where I thought I had seen other people turn around only to worry for the next mile or so that I had cut the course short. I kept asking people running along side me. Ultimately my mileage and my race tracking showed me I hadn’t cut the course. The second loop started off with that worry and the knowledge of the hills that were to come. My second round of splits really told the story. It was almost immediate that I slowed down. By the time I got to Brandywine Park I was almost 2 minutes per mile slower….ignore the splits shown from mile 22-24…I hit my lap button by mistake and was just trying to get aligned with the mile markers. The second half of the course had much less runners and as we were going through mostly residential areas the spectators were limited. There were a few fresh legged relay runners….grrrr…they don’t make you feel good as you are struggling late in a race. I will say though that the day was beautiful and the sun was out. Once I had the hill at my 25 again I knew that the second half struggle was nearly over. It was a shame. I felt fairly good coming into this but I was just tired. I didn’t have the energy to sustain my second loop. My second half split was 2:15:59, over 20 minutes slower. Still, crossing a marathon finish line is always a win so with a combined time of 4:09:28 it was still not my worst by any means. As you can see from my picture below, I’m still smiling. The race itself was well supported although there could be have been a few more water stops on the back half of the loop. As this was primarily residential I can see how this may have been tough logistically. I think the race team did a great job but I think this is going to be a one and done race for me….those hills!!! !